Captain Picard is back in STAR TREK, but no Longer Captain Picard!? We last saw Captain Jean Luc Picard in the series over 20 years ago. Patrick Stewart made an announcement back in August last year at the 2018 Official Star Trek Convention in Las Vegas that he would be reprising his role in a new series. Below is footage of Stewart making the announcement. Things are not all what we expected, though, apparently he is no longer Starfleet Captain according to Screenrant! ““The feeling is [the Next Generation cast] would love to be part of it. But the feeling is also that it’s Patrick [Stewart]’s show. [Laughs.] Having said that, I can’t imagine a world where there’s no reference to what happened to the rest of the Next Generation cast. Patrick isn’t playing Capt. Jean-Luc Picard this time, he’s done with [that phase of his career in] Starfleet in this show. That’s about the only thing I do know about the show." 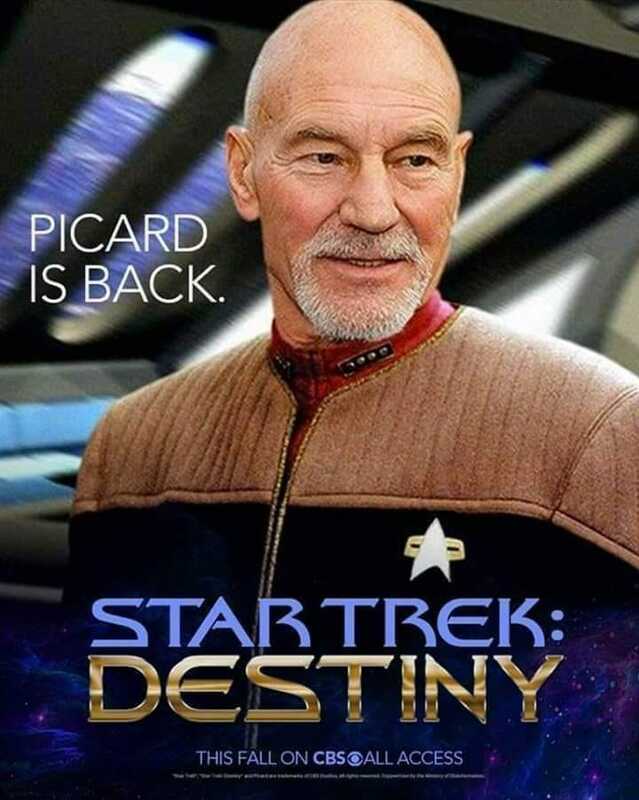 We’ll be getting more Picard but it will be an older and wiser one who has moved on to something else in his life. As like, real people do or something. What a concept. I’m all for adding depth and growth into the mix, I mean it has been over two decades, of course Jean Luc Picard has been getting into more with his life! We’ll be able to see this new STAR TREK series on CBS all access in late 2019! I'm not entirely sure if the title in the photo above I was given is legit, I cannot find any evidence that the new series is called DESTINY, but I did discover that there was a STAR TREK book series by the same name, so it's a possibility for the on the new TV series. Also, as a sweet bonus for you guys, I’m sharing a POGO video that I love. He makes some cool and somewhat ambient music mixes using dialogue from movies and tv shows. He’s probably most well known for “Alice.” Listen to POGO’s Data and Picard right here.